O Museo do Oro é imperdível. Embora esteja quase que esquecido, vale a pena conhecer. São centenas de peças em ouro de diversos locais do Perú e de diversas culturas precolombinas. Além disto, temos o Museo de Armas. São armas do período colonial de de ocupação que nos demonstram o poderio europeu, dominador da fundição, contra os povos locais, que só tinham armas fabricadas de pedras e madeira. Mujica Gallo foi um grande homem por colecionar estas milhares de peças. This Museum has a very impressive collection on Weapons and Pre-Inca Gold pieces. The guide who joined us for this tour was really helpful in explaining details on traditions and culture. Was not good.Started late and don't beleive was worthy the money. Interesting tour with a highly knowledgeble guide. The weapons collection was very impressive for a private one. Great experience. 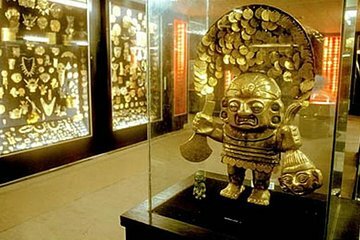 The Gold Museum itself is great and defintely a must in Lima. The guide was also a nice person. However the tour was too short and, *unacceptable*, does not include a guided tour through the Weapons of the World museum, which could be even more interesting as the collection is really extense (even bigger than Gold's). The guide left us with only 20 minutes to visit the entire collection by ouselves, which is clearly insufficient. One word: frustrating.